During the summers of 2012 and 2013, a group of trained border collies patrolled 200-meter stretches of beach around Lake Michigan. 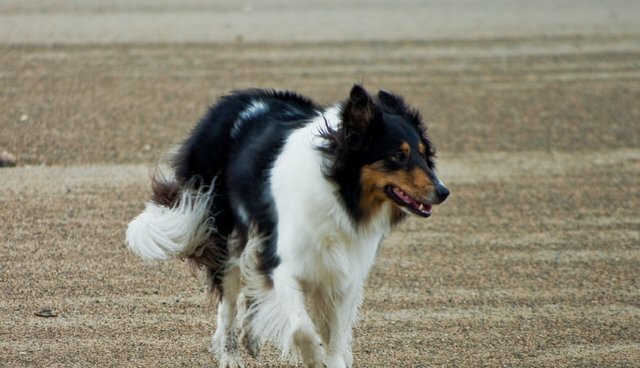 When a gull was nearby, the collies' handlers taught the dogs to do what dogs do best: chase. By shepherding the birds off the sand, the dogs lowered bacteria levels significantly during the early summer months. When seagulls poop on the beach, their droppings can spread E. coli and other potentially toxic bacteria into the sand. But if dogs chase the gulls away, according to a group of researchers at Central Michigan University, it's possible to keep some of that bacteria out of the sand and water. "Border collies are intelligent dogs that love to work," states Elizabeth Alm, a scientist at Central Michigan University. The dogs could be "part of a comprehensive management strategy to reduce bacterial contamination at public beaches," she says. The scientists also made sure the dogs didn't contribute contamination of a canine kind. "These were professional working dogs," Alm tells BBC News. "They didn't often poop on the beach, but if they did it was immediately picked up by their handler and disposed of off the beach."